We use cloth most of the time, but we use disposables at night. They are more absorbent and it's just easier for me. My 2 year old sleeps around 14 hours each night so disposables are a must for us overnight. I came across Andy Pandy and knew I wanted to try them. They are bamboo so are natural for baby's bum since they are chemical free. This is important to me when using disposables. I got a Small for my 2 month old and the Large for my 2 year old. The inside looks like any other disposable really. I love the double gusset on them which help hold everything in. The diapers are very soft inside and absorb like any other high end disposable I've tried. They also have the wetness indicator. When baby pees in them it turns blue. An easy way to see if your child is wet or not. Overall Andy Pandy diapers have been wonderful. They absorb just like other diapers that we've used and are really soft. My favorite part is that they're all natural though. They DO NOT contain chlorine or alcohol or preservatives. Free of Phthalates, no Latex, PVC, TBT, or antioxidants. The diapers have a 100% bamboo top sheet which wicks moisture away and is super soft and silky against the skin. Elastic waistband provides a snug, comfortable fit. Natural aloe helps nourish skin and an Ultra breathable back sheet made of perforated 100% bamboo fiber, which allows fresh air to circulate and keep baby's skin dry. Bamboo is odor resistant, moisture wicking, hypoallergenic and many other wonderful properties. The diapers DO NOT stink when wet in at all. Most diapers have that distinct smell, but these don't, which is one reason I like the wetness indicator! Although she told me the diapers run a tad big, the small fits my 2 month old perfectly. He was about 5 weeks when we started using these and around 11 pounds and they fit him great. Now he's about 12.5-13 pounds and they still fit him great with room to grow. My 2 year old is 24 pounds so I knew the large would be best for him, although he'd probably fit the medium too. They come in Small (6.5-17lb), Medium (13-22lb), Large (20-31lb) and XL (26+lb). Price: They are $36.95 for a case (62-94 diapers depending on size) on Amazon. Thanks for the great giveaway!! Awesome post, can't wait to try them for my twins! I love that they are eco-friendly. I love that they are chemical free! I like that they are Eco-Friendly. Thanks so much. Love Andy Pandy diapers!! Especially love that they don't contain harsh chemicals and they're eco friendly. They are 100% biodegradable! Love that!!! I like that it doesn't have any Latex, PVC, TBT, or Antioxidants. I like that that are Eco friendly! I love that the diapers are Eco-Friendly. I love that they are 100% chlorine free! I like that it is 100% chlorine free. I like the 100% bamboo fiber top sheet. 100% Chlorine Free is perfect. I like that there are no preservatives. Thank you for this review and giveaway!! I'm in the beginning stages of researching cloth, but I would like a natural alternative while I'm transitioning. We've used cloth because my sons skin is apparently allergic to life. It'd be nice to have a disposible that actually works and didn't cause him to break out! I like that these diapers are eco-friendly. I like that they are eco friendly and also that they are free of bad things for a babies skin. 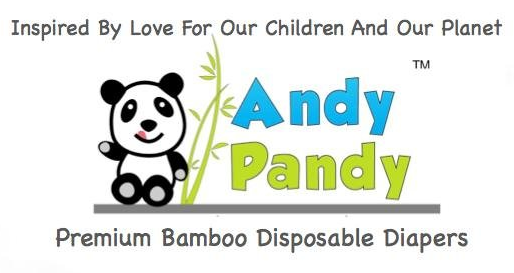 I like that the Andy Pandy diapers are eco friendly and chlorine free. I love that every purchase supports St. Jude's! I appreciate that they are eco-friendly! I love that they're biodegradable! I love that they are all natural! I've been noticing a diaper rash with the regular disposables that we sometimes use. I like that they are 100% Chorhine free. I like that they are Free of Phthalates. I love that it's 100% Chlorine Free! No chemicals and eco friendly. I love that these are Eco-friendly. I would love to try these some time. It sounds like they would be very absorbent if your child can wear one for that long overnight.